“Holy Scriptures of Dao.” Jeung San Do’s sacred text, an authoritative compilation of the holy lives, words, and work of Jeung-san Sangjenim and His dao successor and consort, Taemo Go Subunim. The Korean-language Dojeon was published in 1992, a revised edition followed in 2003, and translations were published in English, Japanese, Chinese, German, French, and Spanish in 2004. The bilingual editions were released in English, Japanese, Chinese, German, French, and Russian in 2014.
and consort, Go Pan-rye (1880-1935), known by Her title: Taemo Go Subunim or Taemonim. Arranged in eleven chapters, the Dojeon spans Sangjehnim’s and Taemonim’s lives, their work, their disciples, the principle upon which the universe evolves, the ultimate destiny of humanity, the existence of spirits, meditation, the times we live in, the coming civilization, and much more. The Dojeon records Sangjehnim’s and Taemonim’s blue prints for the future, revealing the true path that will allow the people of the world to survive the Later Heaven Gaebyeok and enter the new civilization of immortality. Through the Dojeon, the reader can begin the process of understanding Jeung San Do’s Eight Teachings : Sangjenim; Cosmology; Humanity; Spirits and Taeeulju Mantra Meditation; Human History (The Work of Renewing Heaven and Earth); Salvation (Events of the Autumn Gaebyeok); The Subu (Dao Lineage and Authority); The Ilkkun (Workers) of the Work Under Heaven. 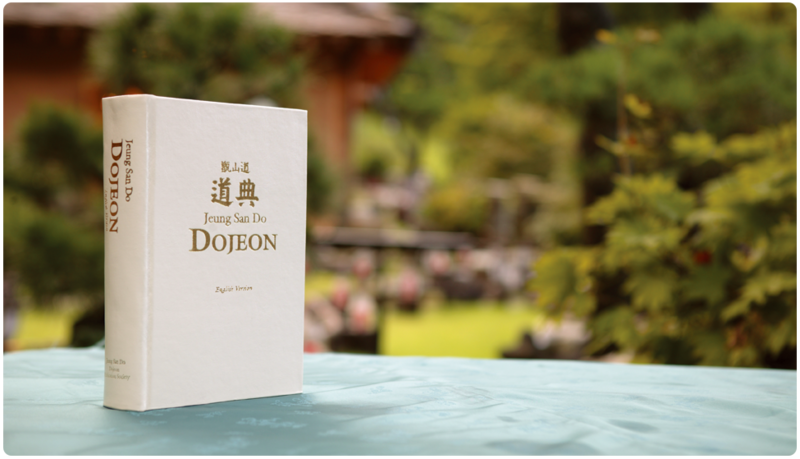 The original, Korean-language edition of the Dojeon was published on October 25, 1992 for the 122nd commemoration of Sangjenim’s birth. It entailed twenty years of extensive research and fieldwork by Jeung San Do practitioners as they compiled the written and oral testimonies of Sangjenim’s and Taemonim’s disciples, the disciples’ descendents, and the disciples’ students. language editions in English, Japanese, Chinese, German, French, and Spanish, which were unveiled at the 2004 Frankfurt Book Fair, the world’s largest. Today, Dojeon had been translated in 9 different languages, including English, French, Deutch, Spanish, Russian, Chinese, Taiwanese, Indonesian and Japanese. Within the Dojeon lie the entire past, present, and future. Everything that all of humanity aspires to know is contained within the Dojeon. Throughout the fifty thousand years of the Later Heaven, the Dojeon will be the text of life for all of the new world’s humanity. Politics, religion, economics, culture, society, and a myriad other such fields are nestled within Sangjenim’s one truth. This one truth, the culture of unification, and the ripened culture―all are bundled together within the Dojeon.